50 %of the Proceeds to be donated to START (Humanitarian Arts programming for the Middle East). 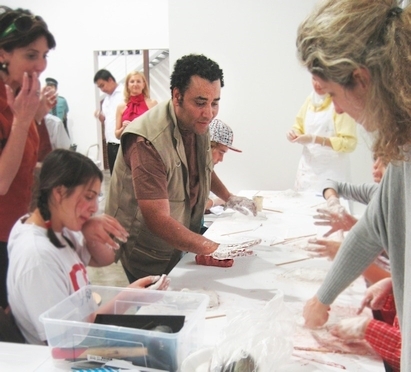 In March 2007 the Al Madad Foundation and Art Dubai worked in partnership to launch START. START delivers practical arts education to young people. We organize gallery tours, artist`s lectures, exhibitions and workshops for all young people in the community and we aim to reach out specifically to teens with special needs, orphans, refugees and working children. START enriches the lives of young people by helping them to discover their talents and develop new skills they can be proud of. Workshops are taught by practicing arts professionals who volunteer and we offer training to people who wish to volunteer and teach young people with START. START is a non-profit program. We are funded from donations and devote this money to purchasing art supplies and organizing art workshops that are free. Ahmed Askalany was born in 1978, Nag Hammadi, Egypt. He lives and works in Cairo. Askalany’s work retains an explicit connection with traditional materials and craft methods associated with the ancient cultures of Egypt. Woven palm leaves and resin offer him an essential association with his native roots. His subjects include human figures and animals inspired and representative of his native town, Nag Hammadi, in Upper Egypt. The figurines are characterised by a preserved, mummified-like look. Nonetheless, the work remains of a profound nature, possessing a certain gesture and a sense of innocence reflecting a sense of frankness, candour and irony. Askalany’s work is characterised by traditional plastic forms that place emphasis on structure and volume. Yet, his approach remains far from being restrictive. On the contrary, Askalany challenges the very boundaries associated with the notion of what is perceived as crafts and the arts. He offers a new capacity for interpretation and aesthetic value. By doing so, Askalany manages to respond and contribute to the complexity of contemporary artistic practice.